You bring the party, we do all of the work! The set up, refereeing, and the close down! + Just what is ManaBall? In the industry, our equipment are known as "bubble balls", "bubble soccer", or "Bumperballs". But for our branding purposes, we like to call them "Manaballs" after the hawaiian word "Mana". A ManaBall is a single circular-like shaped inflatable ball that is worn like a backpack: Has adjustable shoulder straps and bar handles. Basically imagine yourself playing bumper cars but instead, inside a big plastic ball and slamming yourself against a friend or family member inside another and there you have it! Bumper human! So how this works is we do not sell the ManaBalls but rent them out. We do the setting up and breaking down process, and also provide a referee to oversee gameplay and safety. Basically, you'd just bring the players, we do all the work! For a appointment to be successfully made, we'll need the following key information from you: Number of potential players, desired date of appointment, if you want a 1.5hr or 2.5hr rental, desired location of appointment, and source of payment. We currently have a max inventory of 24 ManaBalls but definitely can accomodate more players if needed. Unfortunately we do not have a set location but our ManaBall games can be played on any flat surface. Besides asphalt or sand. Perferably a area that is comfortably large enough for a small soccer game. EX: Enterprise park. Caldwell Park. Highland park etc. (We can provide you a list of parks that we personally have deemed safe and adequate space for our service.) We can even come to your backyard! To help us prepare the best ManaBall experience for your appointment, we'd like to know the purpose of your scheduling with us. For example, would it be for a birthday party? Corporate team building/bonding? or just want to knock your friends/family around? We have a long list of games that are customizable. Meaning we tweak our games to fit the type of appointment that you seek. + How can I provide payment? We accept payment at the location of the scheduled appointment. Please let us know in advance though if one person or more is responsible for paying the rental fee. If sharing the cost with others and need to know how much the cost is per player we can definitely calculate for you. While the same risks apply with ManaBall as any other contact sport, it actually is very safe because the majority of your body is protected by a giant ball of plastic. You'll also be strapped in with shoulder straps and handles. In our research from reaching out to other similar businesses, its VERY rare for a client to even suffer from a broken bone. 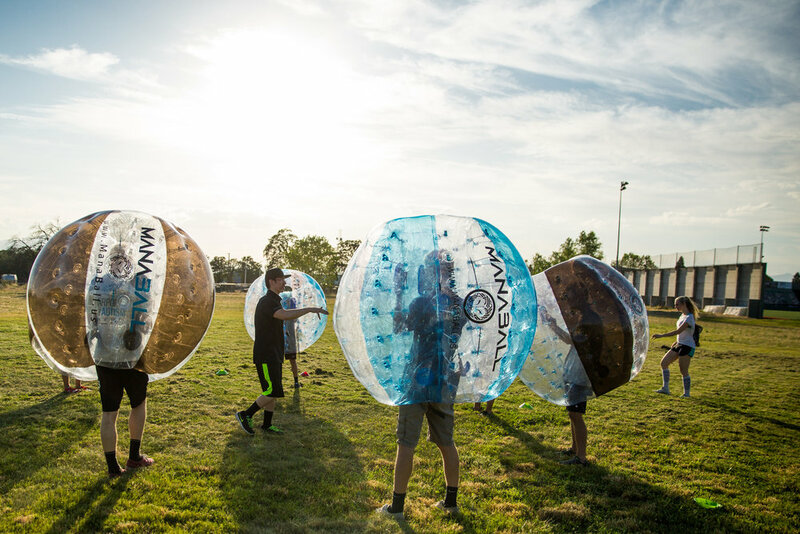 There are always going to be risks with any contact sport, but we at ManaBall so far have maintained a very safe history and many of our clients are loving it because its like wrapping oneself in bubble wrap. As long as everyone abides to our safety and play rules, we can assure a fun and safe experience. + What is provided with the rental? We provide the full setup of the ManaBalls. (delivery, inflation and breakdown). We will also provide a list of "games" that you can choose to play. With a rental of and a referee to help run the games. If you know who will be on your team ahead of time, color coordinate, dress up, have fun! Remember to wear clothing suitable for an outdoor recreation purpose! No loose jewelry or open toed shoewear. + What is the height requirement for ManaBall? It is crucial that we know the average age or height of the overall party as we have two sizes, a medium and a large. A medium fits heights of 5'4 or shorter, while the large fits 5'4 or taller. + How old do I have to be to play ManaBall? 17 years or younger must have our liability forms signed and accompanied by a supervising adult. + Can we do rentals outside of Redding? You bet! We cover all of Northern California! But, customers are responsible for getting permission to use private/public property they've chosen for the appointment outside of the city limits of Redding. A fee of $.25/mile will be charged after 30 miles outside of central Redding. However, if appointment is for an event or special occasion, the fee possibly can be waived or negotiated. + What if a party member doesn't show up to the appointment? If you scheduled and paid in advance, we'll immediately refund you that person's fee which could take up to 2-3 days. If didn't pay in advance, we simply will only charge for players that are present.